The winter doesn’t have to be a time where the rust and frost consumes your short game. Nowadays, with the amount of training aids and technology available, you can steal more money away from your buddies than ever before, just by improving your stroke during the winter. Here are a few ways to stay sharp, gain confidence, and make more putts than ever before, all by working on your putting during the winter. 1) Find a putter that fits you. Too often we get a hand-me-down putter or find an old or trusty, rusty putter in the garage. Then we take it to the course and make a few putts and think it fits. Bad strokes can still make putts, but you won’t have longevity with your putting when using an unfit putter. Getting custom-fit to your putter changes everything about your practice. When you have a putter that doesn’t match you, it can make you change proper fundamentals. Your eye line, distance from the ball, posture, and perception can all be drastically affected by the wrong putter. Do your golf game a favor. Head to your nearest custom fit club shop and make sure you have a putter that fits you so you can truly practice with a purpose. 2) Work on your aim and perception. If there's one factor that affects putting the most, it’s how you initially aim the putt during your set up. If you have a tendency of aiming 2 inches right of the hole on average, no matter what, you have to develop a pull stroke. This makes right to left putts virtually impossible unless you use speed to knock it through the break. Then its 3-putt city if you miss. Start by figuring out what your dominant eye is. First, put your hands together so they create a peep hole right in the middle of your hands. Next, with both eyes open put an object in the middle of the hole. Now close one eye and then the other. Whichever eye still sees the object is your dominant eye. You will see players like Keegan Bradley actually turn his head so his dominant eye sees more of the putt. By learning to see the putt better and aiming properly, you will have a better chance of holing all of your putts. 3) Use a SAM Putt Lab. 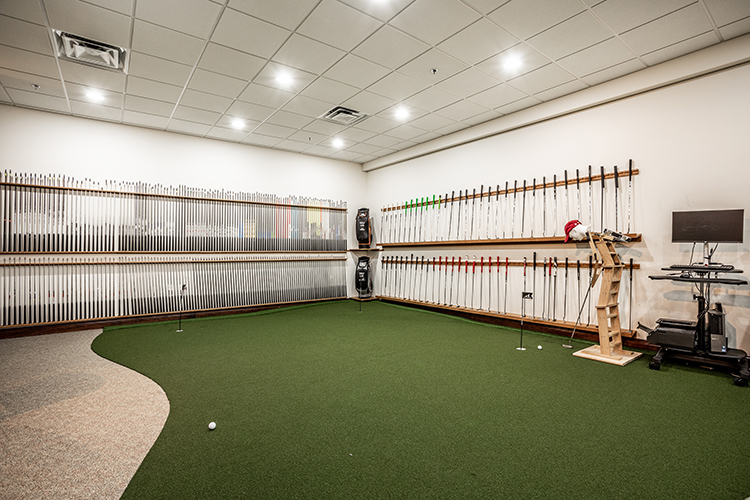 During the winter, finding a facility with a SAM Putt Lab can be a vital tool for feedback. SAM Putt Lab essentially tells you everything you need to know about your stroke from tendencies, aim, face to path, and rhythm of the stroke. If we don't know how we're putting and just rely on Golf Digest to give us random tips to help out, then we’re just leading ourselves to more problems. Every golfer is unique, and no two people have the same body. So using the SAM will allow you to see where your problems are and what you need to work on during the winter to fix them. If you're up in Indiana, check out Indy Golf Lab. They have everything from SAM to Quintec to give you a feel of how you're rolling the rock. Training aids nowadays are better than they’ve ever been. There’s an aid for virtually every putting flaw on the market, and some devices can practically hit the putt for you. Out of all the putting aids available, the best ones would have to be the putting arc, putting mirror, and a metal meter stick. The putting arc is a device that allows you to glide your putter on a slightly arc'd board that gives you immediate feedback. Putting mirrors are excellent for monitoring your eye line for each and every stroke, and they typically also have a stroke assist for the back swing. Last but not least is the meter stick. It’s humbling in that you have to roll the ball all the way down the stick and into the cup. This can be very challenging, but once you get the hang of it, your 3-footers will be no problem. You can pair all these in a basement with any putting mat and shave tons of strokes off your game. Putting may be the smallest motion we ever do in the game of golf, but it's something that needs to be monitored so it can be mastered. Most players on the PGA Tour have different grips, set ups, and putting styles. The reason they make so many putts is because they have become so consistent at a repeatable stroke that rolls the ball on their intended line each and every time. This is very hard to do day in and day out without a PGA instructor. Just like the golf swing, it can be tough to watch ourselves swing or putt and make sure we're working on the right fundamentals. Having a knowledgeable putting coach will turn 36 putts into 32 just from having the correct posture, alignment, path, and consistent aim to have you draining putts like never before. If you focus on even 3 out of the 5 things on this list, it will be paramount in your success on the greens. The winter does not have to be a time your putter gets cold. Rather, use this time to get your short game to really heat up.